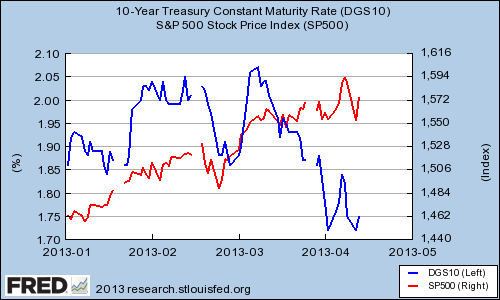 Are Bonds Announcing a Stock Market Correction? This week's see-saw dynamic in U.S. stocks continues this morning, with the S&P 500 and the narrower, price-weighted Dow Jones Industrial Average up 0.65% and 0.55%, respectively, at 10:05 a.m. EDT. Even before this week's stock market gyrations, which were kicked off by a sharp decline on Monday, many investors and pundits had been loudly calling for a correction. Indeed, the market's rally since last year's June low has been a dogged, low-volatility climb that appeared to break from the "risk-on/risk-off" dynamic that has governed asset markets in the aftermath of the financial crisis, despite the fact that many of the same macroeconomic headwinds remain. One ominous sign for stocks can be found not in the stock market, but in bonds, with Treasury bonds in particular finding new favor with investors since early March. Bill Gross, who manages PIMCO's Total Return Fund, the world's largest bond fund, has lifted its allocation to U.S. Treasuries to 33% against 28% in February -- the highest it has been since July. The decline in yields suggests that the risk of deflation, or at least a slowdown in the economy, has increased. While I'm not convinced that a stock market correction is imminent, I do think this week is a healthy reminder that stock prices do not move only in one direction. Volatility had been remarkably muted over the past several months, and investors need to accept that this is unlikely to be the status quo on an ongoing basis. The Motley Fool's chief investment officer has selected his No. 1 stock for this year. Find out which stock it is in the brand-new free report "The Motley Fool's Top Stock for 2013." Just click here to access the report and find out the name of this under-the-radar company. The article Are Bonds Announcing a Stock Market Correction? originally appeared on Fool.com.